Here’s a Sun journalist visiting the site in late December. This IP address – 143.252.80.124 – doesn’t bring up any WHOIS info at the moment, but here’s someone from Usenet who tracked this IP address back to News International in Jan 2004. I think you’ll agree that its’ a pretty Sun-centric story (Won’t somebody pleeease think of the children?). Perhaps a Lexis-Nexis user would care to seek out a Sun story based on adoption guidelines in late January or early February 2004. If you wish. No big deal. This is what I suspect to be another Sun journalist viewing this site in early January. 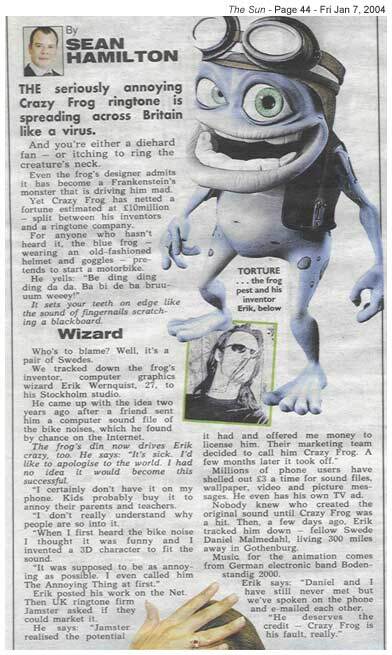 The reason for this guess is this Jan 7 article from The Sun by Sean Hamilton about… the origins of the Crazy Frog ringtone. 1. Yes, I’m aware that News International IPs may also indicate visits from other minions of Murdoch, such as those from NOTW and The Times. It’s just that my belief if coincidences has been strained lately. 5 Responses to "The Sun reads Bloggerheads"
Heh. Thieving bastards. Can’t say it surprises me. What are the chances of getting cash out of the buggers?In other news, I seem to have a pet fascist over at my place. He’s kind of cute. He is a charmer, isn't he?http://europhobia.blogspot.com/2005/01/west-yorks…Your typical anonymous coward at work. Don’t sweat it, mate. It took me a long time to come out from behind my nickname. Plus, your website makes it clear what your values are and what your agenda is.